Audi just dropped the 2014 RS7 on us here at the Detroit Auto Show. I'm now trying to figure out how I can afford one. In the last 20 minutes, I've considered befriending an older woman to leave me her fortune when she dies, robbing a K-Mart, and even becoming a man version of a lady of the night. But then I figured out just what I needed to do. Audi, can I exchange a spleen or kidney for an RS7? Please? For those who still foolishly believe they'll need their vestigial organs, allow me to explain. The RS7 is the ultra hot version of the A7 and S7 that are already prowling the streets. But unlike those cars, the RS7 has 560 HORSEPOWER AND 516 POUND FEET OF TORQUE from its 4.0 liter TFSI V8. All that power is fed through an eight-speed tiptronic. I wish they were using the S-Tronic that is in the 2014 R8, but I'll deal with it. It sounds like it's ZF's latest and greatest automatic. I'll let it pass. Audi, do you need some fingers? I surely don't need all of mine. Acceleration is brutal, with the industry standard 0-60 coming in a crazy 3.7 seconds. Top speed is 190 MPH in a motherfucking family sedan. Audi, I've heard people can survive without a large intestine. Do you need one? Great price. We also have one hell of an aggressive design. Front vents are three times larger than any other car Audi currently has. Three times. 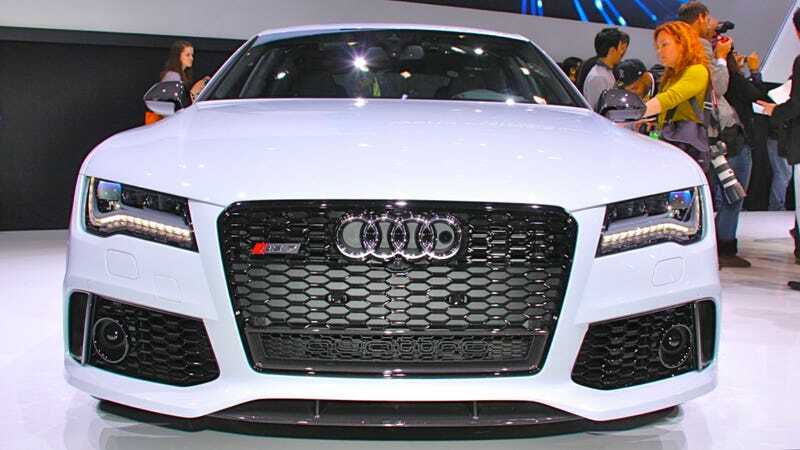 The large quattro lettering in the front grille is a little over the top, but I'll deal with it. The huge trumpets out back also make it easier to dragon. That's a win. My only contention with the exterior is that Audi put chrome wheels on it. Chrome isn't going to happen for wheels again. Please don't make it happen again. It's too flashy. It's too wild. It's too much. Matte please. The interior is gorgeous. Carbon fiber is all over the place. There are paddle shifters. It's Audi quality. I'm smitten. I'm overcome with lust right now. Audi, call me. I've got most of the organs you could ever want to put down as an exchange for an RS7. I'll throw in a left ear. Barely been used.